Whether you're looking for modern handles for kitchen units or something more traditional, Ludabak has the answer. Into this latter category there are handles for kitchen units, which serve both functional and aesthetic purpose. Ludabak offers a wide range of thermosetting handles for kitchen units encompassing traditional and contemporary styles. 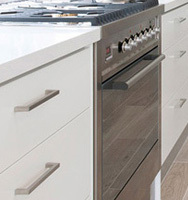 Ludabak is able to provide thermosetting handles and knobs to create perfect finishes to dream kitchens.